On July 18, 2017 students from West Yamashiro in Imari City, Saga, and Nakazato Elementary from Kumejima, Okinawa, met online with Saga University’s Institute of Ocean Energy for an online class and discussion. Students from Imari attended at IOES, while students from Kumejima attended from the Okinawa Deep Seawater Research Center. 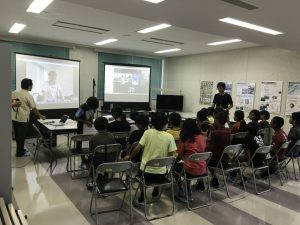 Connected online, both groups received an introduction to Ocean Energy, including OTEC, from Professor Yasuyuki Ikegami, followed by discussions, questions, and introduction of both locals by the students. The collaboration took place as part of a cooperation agreement between Saga University, Imari city, and Kumejima Town. More details are available in this article (JPN).